Eat yourself to good health. House Republicans just unveiled legislation to repeal most of Obamacare, meaning many folks will likely struggle to find affordable health coverage. With less coverage options on the horizon, the least we can do is try to keep ourselves as healthy as possible. In other words, we all need to be boosting our immune systems. One of the best ways to do that is to make sure you’re including immune-boosting foods into your daily diet. We’ve rounded up nine great immune-boosting foods ― in no particular order ― plus recipes so that you can get as many of them into your diet as sounds good to you. Red pepper and spicy sausage pasta. These sweet peppers are an excellent source of vitamin C ― even better than oranges. Luckily, they’re just as sweet as the citrus fruit. Stock up to keep your C levels whenever you can to stay healthy. These red bell pepper recipes should help. This cara cara salad shows you how to add an entire orange to a small green salad and call it lunch. Vitamin C, vitamin C, vitamin C. Eat grapefruits, oranges, clementines ― they’ll all give you a healthy dose, as well. We have recipes for clementines, grapefruits, blood oranges and oranges ― dig in! Garlic butter roasted chicken might be the most delicious way to boost your immune system. Garlic contains selenium, which seems to have a powerful effect on immune systems. And since garlic is a fragrant addition to any meal, there’s no reason you shouldn’t be eating more of the stuff. Get the garlic recipes you’ve been missing. A lemon, chicken and pepper soup. Don’t ever underestimate the restorative powers of homemade chicken soup. There’s science now that backs up this old home remedy. If you’re starting to feel under the weather, make yourself a batch of soup and feel quickly restored. We have the Chicken Soup Recipes you need. Don’t have time for that? Store bought will do in a pinch, too. 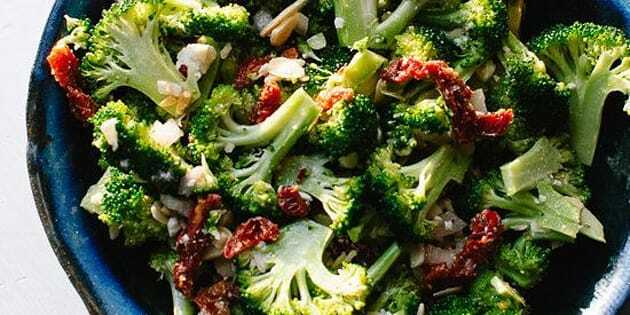 A broccoli salad you'll never get sick of. This vegetable is loaded with vitamins A and C, as well as the antioxidant glutathione. It’s no wonder that your mother was always telling you to eat it. We have all the broccoli recipes you need, and then some. The sweet potato almond butter muffins you want. These tree nuts are full of vitamin E, which are a powerful antioxidant that can help fight off infection. A handful of almonds should do the trick, but what’s the fun in that? Cook with them instead. Get the almond recipes you’ve been missing out on. The turmeric vanilla latte you really should be making. This bold yellow spice might not be the superfood we all hoped it was, but there is anecdotal evidence that it may help fight a cold. And that, doubled with how good it tastes in a latte, is good enough for us. Lattes aren’t the only ways to get down with this spice either, check out our other turmeric recipes. This sautéed spinach is cooked with garlic, giving you the extra immunity boost we all need. They don’t call this leafy green a superfood for no reason. It’s full of iron, folate, fiber, antioxidants and vitamin C. Cook and eat all the spinach you can with these spinach recipes. Probiotics are your best friend when it comes to staying healthy. Naturally found in yogurts, they not only make for a healthy breakfast but may help ease colds, as well. Need inspiration for yogurt, too? Try it in these parfait recipes, you’ll never look back.